Travelling solo on a group tour is a topic I get asked about a lot. It’s only natural to feel a little nervous about joining a group tour if you’ve never travelled solo before. This post draws upon frequently asked questions I’ve previously answered and hopefully it will answer some of the questions you might have too, about first-time solo travel – in relation to joining a group tour. Will I be the only one travelling solo? This is one of the most frequent questions I get asked. If you’re considering travelling with Trek America or Grand American Adventures, you can call them or email them and ask those questions yourself before committing to a specific tour date. I’ve always found that helpful. Most people travelling with Trek are travelling solo and that has been the case for the last six treks I’ve been on with that company. Some other similar companies I’ve travelled with in other parts of the world also attract a lot of solo travellers, but if you’re concerned about this, you should just ask the company before you part with your hard-earned cash. A common concern about group tours is that you might not like your fellow travellers and equally, they might not like you! But if you consider that most people are travelling solo, there are going to be other people in exactly the same position as you who are also wanting to make friends and have fun! Admittedly I do not always like everyone I encounter when I travel (you can’t click with everyone all the time, right?) but I’ve worked hard for my holidays as I’m sure they have too. There’s no need to be rude to a person, or to exclude them, just because you wouldn’t socialise with them back home. You might not stay in contact after the tour and that’s fine but remember, as long as you’re on a group tour together, especially a small group tour, if you don’t make the effort to get along, you’ll spoil your own holiday as much as anyone else’s. Despite travelling solo (or even with a partner or a friend), you are joining a group tour and by all working as a team, you get the most out of the experience. It’s the team focus that I really love about travelling with Trek America, especially on camping treks, you bond quickly as you cook together and complete camp duties – as well as all the fun stuff you have planned! Will I have anything in common with the other group members? Small group adventure travel attracts a diverse range of people and that is one of the things that appeals to me. Despite this diversity, we all have some things in common; a sense of adventure, desire to explore, make new friends and have fun! I’ve made some amazing friends travelling on small group tours, some of those I consider amongst my closest friends now. When you share once-in-a-lifetime type of experiences together, you are bound to make some great friendships. So if you don’t feel like you have anything in common with each other at the start, you certainly will by the end of your trip! Will I get any alone time on a group tour? All itineraries include free time and in the case of travelling with Trek America, you do not have to participate in everything, if you want some downtime, time to do your own thing, that’s possible. I want to do a camping trek, who will I share a tent with? In my experience you choose a tent buddy (someone of the same gender) and a tent for the duration of the trip; on some lodging tours solo travellers might switch who they share a room with. So it’s good to push yourself out of your comfort zone on the first day and getting talking to your fellow travellers and see who you click with. I’ve booked a shared room at the tour meeting-point hotel in advance of my trek, who will I share with? If you’ve booked a shared hotel room through Trek America you will be allocated a room with someone of the same gender. This might not be someone on your trek though, that can depend upon whether other Trek America tours are departing/arriving the same day. How will I get from the airport to the meeting-point hotel? If you have found some of your fellow travellers online in advance of your tour date (see my previous post: Find your Trek America buddies in 5 steps), you might have found someone who is on the same flight as you or who is going to be at the airport at the same time as you. If this is the case, you can then travel together to the meeting point hotel. Meeting-point hotels and information on how to get from the airport are listed on Trek America’s website. In some cases there will be a free shuttle service. Why not try researching your destination on Google Maps Street View? I find this useful if I’m arriving in a new place, late at night on my own, so that I know where I’m going. It can give you a good idea of how long the journey should be if you get a taxi, to make sure the driver doesn’t take you in the opposite direction! I’ve never had a bad experience with this, but a little research can increase your confidence. That’s just a few tips from me. 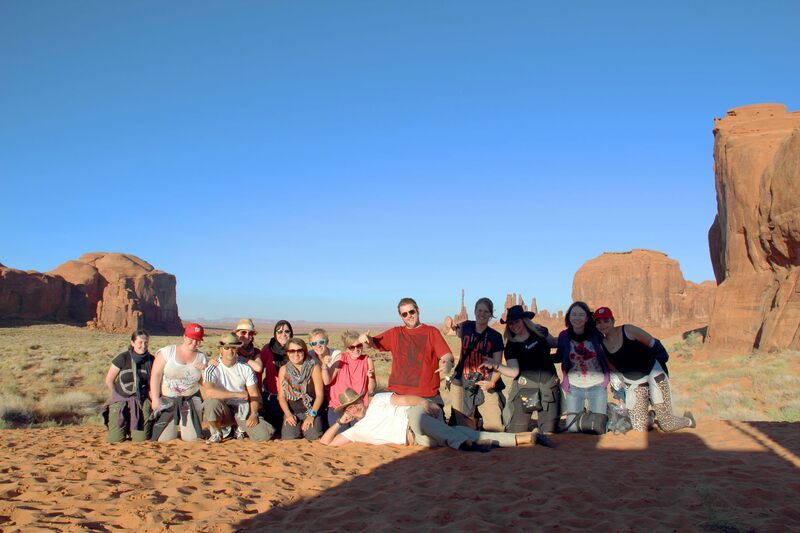 Do you have any tips to share about travelling solo on a group tour like Trek? Let me know in the comments, below. Disclaimer: I was not asked to write this post and have received no payment for it.